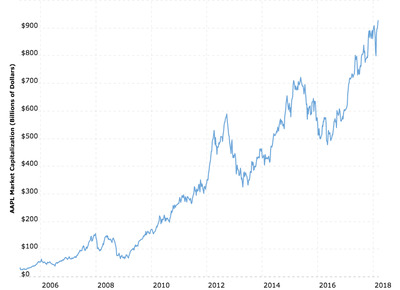 Apple is approaching the historic $US1 trillion valuation milestone. It will be the first company to reach that market cap. One of Apple’s top executives said this week that the company isn’t planning any major acquisitions. Analysts have theorised for some time that Apple has enough cash to do a big acquisition deal – now that avenue seems closed. Apple’s valuation is steadily approaching the historic trillion dollar mark – but an executive hinted this week that there aren’t any giant acquisitions on the way. That shuts down a popular unanswered question about Apple that analysts have speculated about for years: Which giant acquisition could it make as it grows? Apple is the most valuable public company in the world, and its market cap is currently at $US922 billion (£660 billion). It is seeing its stock price rise regularly, and so it’s on track to be the world’s first trillion-dollar company. Macro TrendsApple’s market cap since 2005. That’s going to be a huge milestone. Combine it with Apple’s immense cash pile, and it sets the company up for splashing the cash on a major acquisition. The company’s largest purchase to date was its 2014 acquisition of Beats for $US3 billion (£2.1 billion). But since then, analysts have set out reasoning why Apple may wish to splash out and buy various large companies. A popular idea is that Apple should purchase a media company in order to beef up its original content. Adding Netflix’s shows to Apple Music, or Disney films, would make that service far more desirable. Interviewer Dylan Byers asked Cue whether Apple’s recent acquisition of digital magazine app Texture set things up for a larger media acquisition. And that does indeed seem to be Apple’s strategy. Instead of spending billions on established businesses, it prefers to make smaller purchases and then to grow the company internally. Cue’s comments at South By Southwest effectively end one of the most popular thought exercises for Apple analysts. 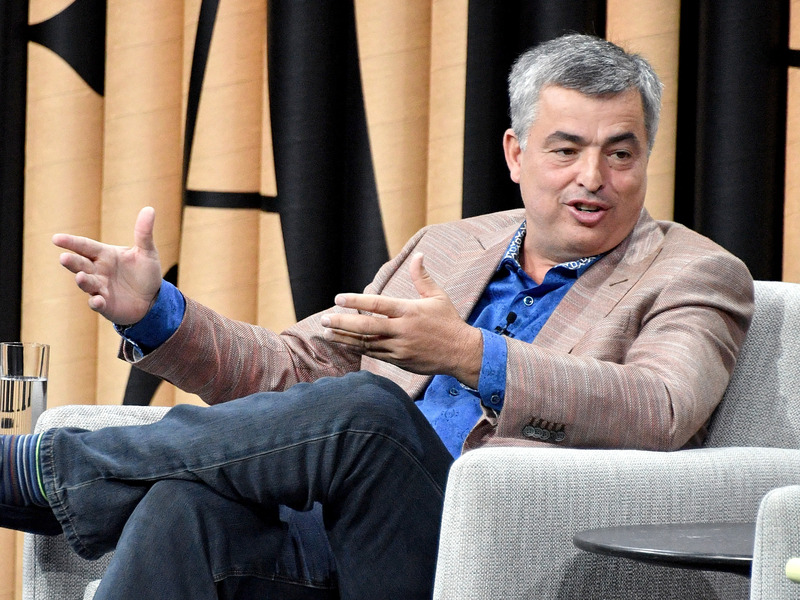 They’re no longer free to speculate about potential major acquisitions from Apple. Or, analysts could take a closer look at Apple’s core business: iPhone sales. The picture there isn’t universally pleasant. A series of analysts have downgraded their production forecasts for Apple’s latest iPhone, the iPhone X. They cite “sluggish” demand for the phone, which forms the core of Apple’s business. One new budget line is original content. The company reportedly has a yearly budget of $US1 billion (£716 million) to spend on content for Apple Music. With $US252 billion to spend, it will take a long time to burn through that cash even if it quintupled its budget. And then there is augmented reality. “We think it’s going to be huge,” Cue said at SXSW. But we still haven’t seen a massive new product idea from Apple in that area. So Cue’s statements actually make Apple’s choices look tougher. If M&A is off the table, then perhaps Apple has an amazing multibillion-dollar product up its sleeve that we don’t yet know about, one that can reignite growth at the company. That’s the optimistic solution. The flipside of that is, Apple doesn’t have a new product, it won’t spend its cash on a dramatic acquisition, and it will remain dependent on the iPhone, which is entering its third year of minimal-to-non-existent growth. And that is a trillion-dollar headache.